WIRE AND CABLE For purposes of electrical installations, a wire is described as a stranded conductor covered with an insulating material. The term cable, as used in aircraft electrical installations, includes the following: ! Two or more insulated conductors contained in the same jacket (multiconductor cable) ! Two or more insulated conductors twisted together (twisted pair) ! One or more insulated conductors covered with a metallic braided shield (shielded cable) ! A single insulated conductor with a metallic braided outer conductor (RF cable) For wire replacement work, the aircraft maintenance instruction manual should be consulted first. The manual normally lists the wire used in a given aircraft. CONNECTORS Connectors are devices attached to the ends of cables and sets of wires to make them easier to connect and disconnect. Each connector consists of a plug assembly and a receptacle assembly. 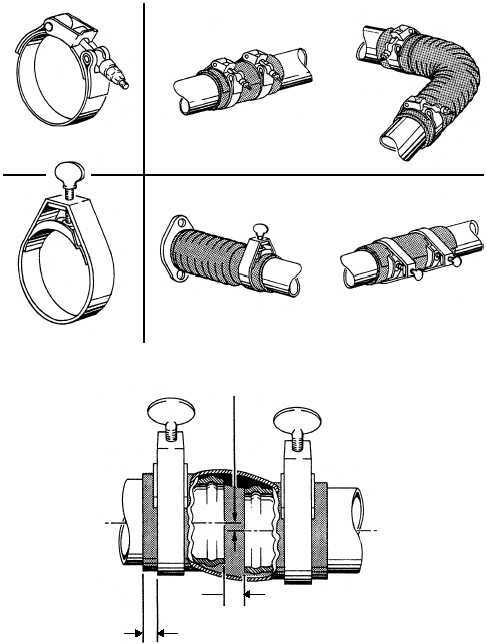 The two 5-13 ANF0518 MARMAN BAND CLAMP MARMAN BAND CLAMPS TO BE USED IN TIGHT AREAS AN737 BAND CLAMP FOR STANDARD INSTALLATIONS AN737 BAND CLAMP 1/8 - INCH MAXIMUM MISALIGNMENT 1/8 INCH MINIMUM 3/4 INCH MAXIMUM 1/4 INCH MINIMUM Figure 5-18.Flexible line connectors.